A Frugal Furniture Refresh and Reality Check about "Things"
Hello wanderers! Welcome back to my stream of consciousness. Today we are going to talk about how I frugalized my itch to redecorate our living room and bedroom and how, just after completing this fabulous redesign, my dog reminded me not to place too much value in stuff. First, our living room. We have a very cute green sofa that my mom bought me as a housewarming gift of sorts when I moved into my home 2 years ago (actually she knew that I would buy something on Craigslist and she really wanted me to have something nice- thanks Mom!). So cute right?! Well, for the other seating in our little living room, I used a chair that my mom gave me that was my grandmothers. I love a hand-me-down. It worked okay and didn’t look bad by any means. BUT, it was pretty big and awkward for the space, make the room feel a little lopsided, and no one ever sat in it because it was the one big chair. We also often need more than 4 chairs around our little kitchen table and would go down to the basement to get our extra chairs. I realized that if we had 2 medium sized chairs in the living room, we could just turn those suckers around for extra table seating! We also could use some more seating in the living room and 2 chairs would just be oh so aesthetically pleasing. So my mind was set- and once I get something in my mind that I want, I get a little crazy about it. The problem: CHAIRS ARE CRAZY EXPENSIVE. This is what I wanted/envisioned for my eclectic/boho/modern style. Ah yes, the basic betch west elm chair in every interior design instagram where the light filters just so and the preset changes the color of everything in the room. Any guesses at what these suckers go for? On sale today for $500 each??? What a steal! Millennials pull out your credit cards and think about the money later! No. Don’t do that. Okay so normally two of these chairs would run me $1400. That’s about 1/4th of my Roth IRA for this year. Yeah, no thanks. Don’t be discouraged! I told myself, you would never buy NEW anyways! You can find authentic mid-mod furniture used and be the coolest of cats. I set myself a $200 total budget and started the hunt. On Craigslist first, of course. Check out my Guide to Buying Everything on Craigslist to get the best second-hand hunting tips! Guys, like I said Mid Mod is basic AF and so hot right now. The people of Craigslist are aware. Anything I found remotely resembling what I was looking for was priced $200 per chair and up. I pressed on and kept trolling Craigslist for a week. I decided to escalate things and visited a few antique/used furniture shops. When I told one of the owners of a (pretty dumpy) used furniture shop what I was looking for and what my budget was, he laughed at me. I am not kidding. He said $300/chair was pretty much the minimum unless you were getting cheap Target stuff. Alright then, should I forsake my buy used values and just get some friggen Target chairs? I was in a chair frenzy at this point. I NEEDED two chairs NOW. Are you freakin kidding me???? Target chairs are almost $300 a pop??? My budget of $200 total felt as out of reach as my career goal of becoming a law school professor. Okay kid, regroup. What is important to you here? That I have 2 chairs, of the correct size, in a light color, for under $200, in a cool style, second hand. Okay, we need to let go of the West Elm dream and expand our search a bit. With that mindset, I found 2 used grey upholstered chairs on Offer Up (a really good alternative to Craigslist btw) that were priced at $200 total. I offered $180, they accepted, I was on top of the world. I went to pick up the suckers and knew they were too big. I bought them anyways. Brought them home, wayyyyy to wide. Okay, minor hiccup. We can still do this. I listed the chairs on Facebook Marketplace and Craigslist and had them sold in a few hours for $200. $20 ahead in the chair game! I kept trolling Craigslist, Facebook Marketplace, and Offer Up and tried to be more open to other styles. Then, boom. Some authentic mid-mod chairs that were metal instead of wood on the ole Craigslist. Change of vibe, but still fit in the room, we have tons of gold/brass accents going on (and silver… is that bad?). Price: $60. TOTAL. They could use some new fabric, but that wouldn’t be too hard with this type of chair. This is now 3 weeks after I started my chair hunt. I immediately contact the seller via text and let her know I am interested. She says there is another person who also contacted her and she will sell to whoever can come pick them up first. Shoot! It is Friday and I am off on some ski adventure this weekend. I think fast and decide this girl is legit and offer to paypal her now and pick them up on Monday night. She agrees! I have had amazing luck with trusting people on Craigslist, never had a deal go sour. Cute right? With the $20 I made on flipping the other chairs, these netted out to $40 total. Did I use that as an excuse to buy new pillows for the couch and lumbar pillows for the chairs? Yes, yes I did. I wanted to room to be a little lighter and brighter for spring. The total for the pillows was $50. Sick of furniture yet? Too bad! We still have the bedroom to talk about! Our bedroom has pretty much been unfinished since I moved in. When I first moved in, I really didn’t want to buy a bunch of furniture so I got creative. I made nightstands out of chairs my mom gave me and planks of white wood. Pretty creative and I didn’t mind the way they looked until they got filled with STUFF. Stuff everywhere all over them that made an already shabby design idea downright messy. The room was just not cohesive. The teal lamps were from Craigslist for $20 total, the blue bed spread did not turn out how I wanted when I ordered it on Amazon, and the whole situation just wasn’t working. I knew I needed some actual bedside tables with a lot of storage to hold all the crap out of sight, or at least in a more organized fashion. So back to Craigslist, Offer Up, and Facebook I went. I was again shocked at how high priced the offerings were. Most were set at over $100 for one (not crappy) nightstand. It was also really difficult to find 2 matching nightstands or end tables. I got frustrated and did some google searching on affordable nightstand options. Most of the suggestions were for stacking suitcases or books and putting a board on top. Look internet, I already went the boho creative route and it wasn’t working for me. Are there no affordable but practical options out there??? Then I saw it, a picture of an Ikea shelving unit next to a bed. BOOM. So much storage. So affordable. I also loved that these were not “nightstands” in the traditional sense so they could be used in any area of the house for storage. This purchase became a no-brainer to me even though it was buying new. I did attempt to find them used for a few days, but didn’t have any luck. I was sold so I ordered online and chose to pick up in store (never walk through Ikea if you don’t have to). New bedroom, commence! Sooooo much better right!? A few notes about the the room. The bedframe I got on Craiglist about a year ago for $60 (it is also Ikea). I painted the lamps white and got some smaller shades for them ($30 total). The wicker storage baskets are from Ikea and are $12 each. I have had the bench for years. I swapped out the rugs from the living room and the bedroom and like them both better now! I simply turned the blue duvet cover upside down- whala! Expensive looking washed linen bed spread. Here is a before and after. The total for this room transformation is $130! 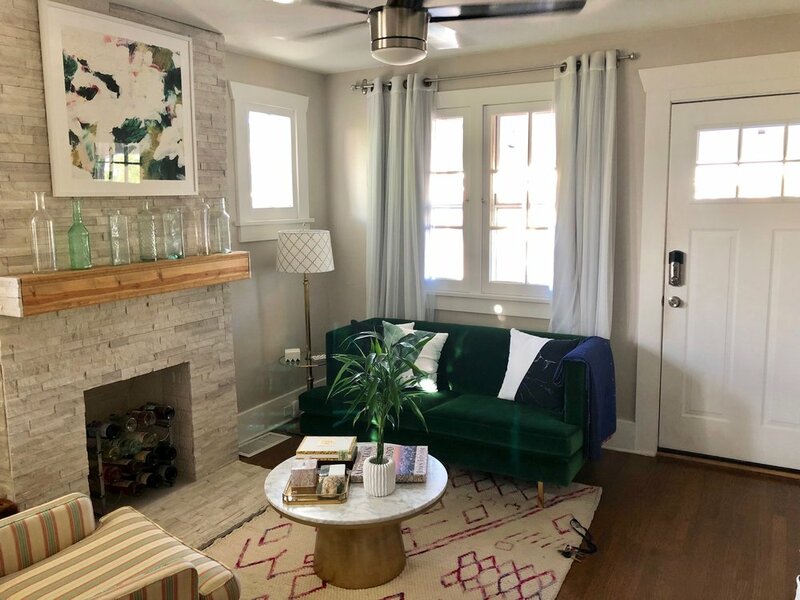 Small changes can make a huge difference in the overall feel of a space- I am so glad I didn’t overhaul the whole thing (which is what I wanted to do I was so sick of how it looked). Ultimately, spending money on making your spaces look pretty can be really worth it if it affects how you feel when you are home. 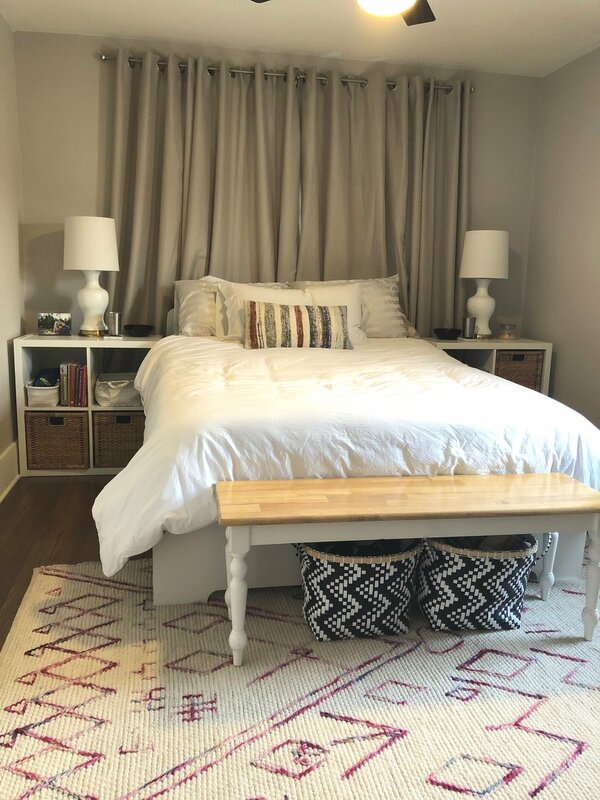 Changing up these spaces made me so much happier when I walked into these rooms- it was so worth it! But, I don’t think it would have been worth spending thousands of dollars if I had done things more traditionally and just bought everything I wanted new. It’s good to flex your creative muscles and make compromises with yourself. However, it is super important not to put to much value in material things. Wanting to create a pleasant vibe in your home is one thing, obsessing over stuff is another. Just in case I needed a reminder of that, my darling dog decided to teach me a lesson. Remember that beautiful green couch? My pride and joy? My ONE piece of new furniture???? ?